You deserve to have power. It is yours for the taking. Gene Simmons is here to unlock the doors to the temple. 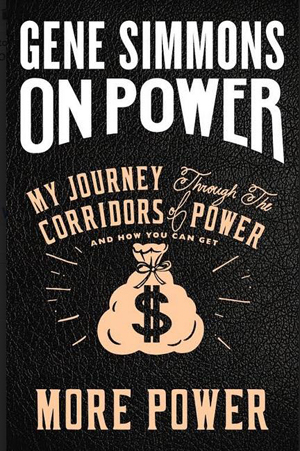 On Power - the new book by KISS bassist/vocalist Gene Simmons officially goes on sale November 14th, but you can pre-order a copy today via Harper Collins HERE or a signed copy HERE or HERE. Gene Simmons, KISS frontman, multi-hyphenate entrepreneur, and master of self-invention, shares his philosophy on power - how to attain it, how to keep it, and how to harness it as a driving force in business and in life. Inspired by Niccolo Machiavelli’s The Prince, Simmons offers his unique take on the dynamics of power in every realm of life, from the bedroom to the boardroom, to the world of rock, celebrity, and social media, to politics. With one-of-a-kind anecdotes from his life and career, as well as stories from historical and contemporary masters of power, including: Winston Churchill, Napoleon Bonaparte, Warren Buffett, Michael Jordon, Oprah, and Elon Musk, Simmons crafts a persuasive and provocative theory on how the pursuit of power drives civilization and defines our lives.